no laptop = all the time in the world. loved this first one by auden. SO. he was quoting from kipling. total “aha! moment” for me. wanted to rush out onto the streets screaming “Eureka”. baby param was watching. so i put a lid on it. And the victim writhes with anguish – like the Jesuit with the squaw! he dropped firstborn off in chennai. then went to mumbai on work. the man returned this morning. please santa. for xmas: i want to have a short-term memory (just like the MMMiM’s). forced to use the husband’s laptop. and he’s going to be travelling. ergo. 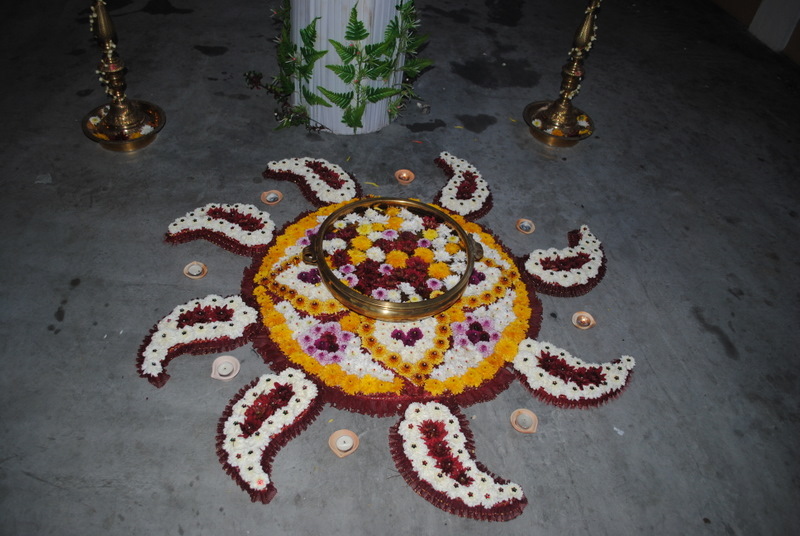 apparently the flowers soaked in water is very typical of thailand, add to that the pookalam, which is very “Mallu” . In this case the flowers were sewn on to glittery cloth and topped off with sequins and glitter. floral alchemy. i turn around to thank him for waiting patiently while i de-loaded baby param’s pram. only to find him busy. sticking his tongue out and licking the boot of a black corolla. …i quickly snowball all worries into an enormous lump. and aim it at myself.